I contribute a weekly column to the Platte County Landmark under the “Rambling Moron” name. It’s a great Northland Newspaper and well worth a subscription. The following is reprinted from the 12/1/11 edition with permission. 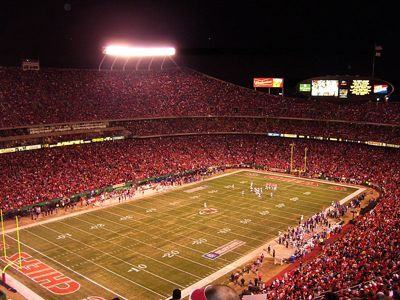 There’s been a recent buzz surrounding both Arrowhead Stadium and Kauffman Stadium that either or both stadiums may have their naming rights sold to corporations. The prevailing rumors are that Google might buy rights to Arrowhead and Arvest Bank might buy rights to Kauffman Stadium. Is taking money to name an inanimate object really such a bad deal? Sure, we’ve got an emotional connection to “The K” or “Camaro-head,” but if we suddenly started calling our coffee maker “Mr. Jigglewarts” instead of “Mr. Coffee,” so what? It still makes coffee, right? If the extra several million dollars a year for naming rights can help bring these two teams – both steeped in decades-long runs of futility – that extra starting pitcher, or a quarterback who stops throwing to the other team, isn’t that ultimately good for Kansas City? Mr. Kauffman reportedly never even wanted the stadium named after him upon his passing in the first place. Reaction of both fan bases has been mainly negative. Have you SEEN our pitching staff? You’re telling me seeing 90 wins at Arvest Stadium is less important than seeing 100 losses at Kauffman Stadium? I say sell out, take the money and run. I’ll get over the emotional loss. I guess it’s hard for people to get over the sheer enormity of what a name is worth. Arrowhead’s rumored deal is for $6 million a year while Kauffman Stadium’s is worth $3-4 million and massive exposure for the rights holder during the 2012 All-Star Game year. It’s okay to get jealous. But these owners have the right to sell those names and we can only hope it will help produce a winner on the field. This is where being a fan means we have to hold our breath and hope. Over 65% of all professional teams play in stadiums who have sold their naming rights – starting way back with Wrigley Field and including such notable names as Minute Maid Park (Houston), Tropicana Field (Tampa), US Cellular Field (Chicago), O.Co Coliseum (Oakland) and, my personal favorite, Enron Field (Houston). I can almost guarantee you that if some generous Platte Countian wrote a big enough check to our esteemed leader and editor-in-chief, Ivan Foley, you’d be sitting in your easy chair reading the Taco Bell / Applebee’s / QuikTrip Landmark right now.